Shoyu Vinegar Chicken LunchBot Trio Bento, a photo by sherimiya ♥ on Flickr. The shoyu chicken I grew up with includes just shoyu, sugar, ginger, and garlic. I recently added a new twist to the sauce when I found a recipe that used honey instead of sugar. That turned out to be a big hit. This time I decided to try the version I saw on David Lebovitz' site, which uses vinegar and shoyu together. Hmm. The caramelized shallots are supposed to add some sweetness to the mix. I thought it was nice, but I think the flavor is probably not as appealing to kids. Mine seemed to like it enough, but I think they prefer the other versions. Along with some chicken pieces in this LunchBot Trio: steamed Okinawan sweet potato flower shapes, red rice with furikake, carrots and pickles, melons and cara cara orange chunks. That sounds pretty vinegary. I think I'd prefer the honey one too and I'm a huge vinegar fan. But, in the bento it looks delicious! I love the color of the cara cara oranges, so pretty. Yeah, maybe you just have to be in the mood for something vinegary. I like balsamic vinegar chicken and red wine vinegar chicken that I've made using Maki's recipes. But this time I was kind of expecting the traditional shoyu chicken sweet flavor so I don't think I'll mess with it next time. I've been tempted to buy Lunchbot since I saw it on your blog but haven't purchased it yet. 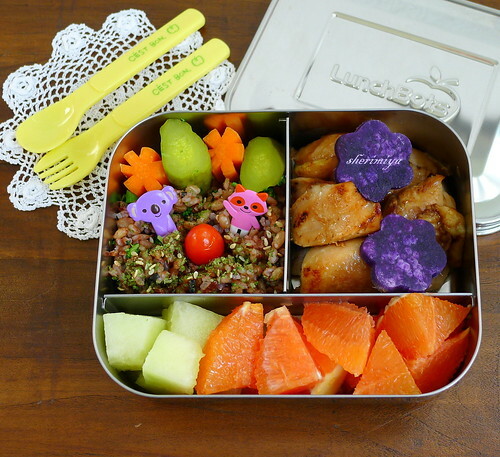 I love looking at all the bento possibilities on your site! Nami, Lunchbot might still be a bit oversized for your little one, but when his appetite increases for sure it's a good choice. I like the idea of storing food in stainless for them, too. And it kind of reminds me of the old-fashioned lunch boxes from the old days in Hawaii. Thanks !